He's perhaps the one person in the current government who has the most ability to actually change people's lives. The Minister for Disabilities, Mitch Fifield. This profile is a simple attempt to sum-up a complex man. With close-cropped hair and a body that retains some of the vigour of youth, Fifield still looks as if he could have made a good player. He waves off that suggestion. He was a basket-baller, doesn’t play sport today and besides, he’s changed his code to AFL now he sits as a Victorian Senator. 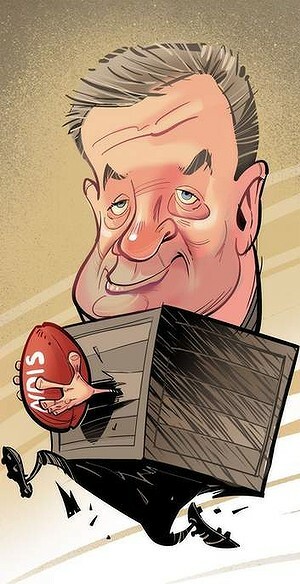 Although Fifield grew up in Sydney (amongst other places) and initially worked for Liberal moderate Bruce Baird, he was soon more closely associated with boss and friend Peter Costello. That’s the easy answer. Just shove Fifield off and stereotype him as a member of someone else’s factional block. Do this and we don’t have to think any more; we can just lock individuals into pre-determined ideological straight-jackets to applaud or condemn as appropriate. But doing this ignores a far more complex reality. To take a simple example (but a very real one, in the Victorian context), Costello’s an Essendon supporter. Fifield, however, barracks for Hawthorn. So does Costello’s one-time bitter political foe Jeff Kennett. Quiz Fifield about his factional links and you quickly get the feeling personalities are (comparatively) irrelevant. It’s certainly true that he’s more interested in policies . . . and yet, the minute I write this, I realise that’s not the entire truth. Some Liberals recently associated him with a Victorian ‘Taliban’ who were supposedly undermining Tony Abbott. Fifield’s got complexities. Perhaps that’s what you want in this politician because today he’s got one of the most intricate, difficult jobs in government: introducing the National Insurance Disability Scheme. The idea was Bill Shorten’s; it came to fruition under Julia Gillard. It’s a great concept, embraced by all sides. This doesn’t mean it hasn’t been used as a political football. Fifield still shakes his head as he talks about Jenny Macklin rushing around in the last election campaign. Macklin’s still issuing imbecilic press releases claiming everything was wonderful before the election. The facts, however, are sobering. These figures all come from Labor’s period in power, although none were released prior to the election. The few trial sites show implementation cost has blown-out by 30 per cent. The Productivity Commission forecast (guessed?) the average price per-person would be $34,969. It’s actually $46,290. This will add more than $5 billion to the total package - more than a fifth of the total sum we spend on defence each year. Further problems: the number of people hoping to access the scheme is almost 50 percent more than expected, yet sorting out participant’s individual plans is taking twice as long as hoped. The idea is great, but the key to resolving issues is implementation. These are now Fifield’s problems, and they’re big ones. Fifield’s committed to both implementation and getting it right. That’s why he’s across the detail. I mention a particular - not huge - service provider. He responds at once, “Yes, that would be Andrew (Richardson).” His comment is interesting because it instinctively reveals something important about the way he views the world. Fifield deals with the individual. That’s why he believes in the NDIS. It’s about empowering individuals to choose a package that works for them, instead of forcing disabled people to adapt to decrees of what’s appropriate from on high. He wants to empower participants and begins to rattle off ways in which it’s changing people’s worlds. Pity the big service providers who think nothing’s going to change with the introduction of the NDIS. It’s going to mean a seismic structural change. Power now resides with the person who wants to buy a service rather than the old-fashioned provider, rationing out its services as it sees fit. Fifield wants to effect a better deal for the individual. “I’m passionate about this”, he insists. More often than not the press clippings align Fifield with the right. That’s because complexity is difficult to compress into a story. He’s been associated, for example, with a ‘ginger group’ (including the likes of former parliamentarian Sophie Mirabella) calling for tax cuts for people earning more than $180,000. That makes for a headline and it’s a good one, but it’s not quite the full story. Fifield’s more concerned about the interplay of policy settings. At the time he commented, “you can’t just isolate tax, or welfare, or work reform - you really have to do all three”. That’s why Fifield can’t be put in a box. He’s aware that if you lift one lever, something will change elsewhere. Simple answers don’t exist.That’s why he’s excited by what’s happening in Western Australia. That state thinks it already does disability care better than the NDIS. Fifield’s organised a competitive trial; four sites, two NDIS and two WA plan. He’s watching the outcome intensely. He’s not playing games. I remember Mictch when he was research officer for Bruce Baird during the Greiner Government years. I should have realised and spoken to you . . .